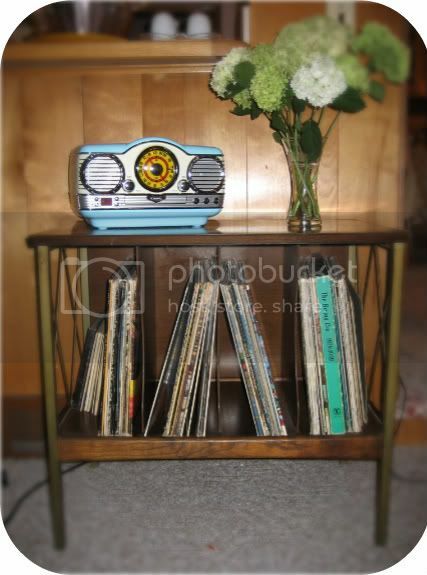 livin vintage: Free Stuff.... It's the Best Kind of Stuff!!! I also found a super old mirror that is currently undergoing some lovin' and once I'm done fixing it, I will for sure show you all -- since I am really taken with that find as well. 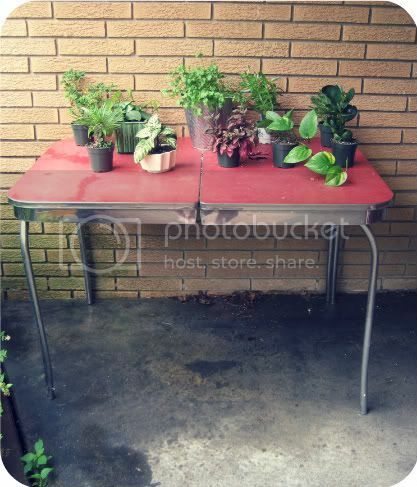 This 50s formica table was also a curbside find. After hitting an estate sale, I was driving through the subdivision looking for a way out and I spotted this guy. A van had already pulled up and was thinking about it, but I knew that they were gonna pass on it. They did and their loss is now my new potting table on my back porch. The table is a bit wobbly and the top isn't in the best shape, so it works great outside. Plus, my patterned concrete is grey and red, so the table matches!! I plan on reinforcing the legs so I can set food and drinks on it when/if I have a party out back. How far are you willing to go to get a good deal? I am known to dig in attics and basements; and now apparently the curb as well. A little dirt never hurt anybody...at least in my book anyway. Free stuff is great! I also have been known to pick stuff up from the curb. The most memorable time was when I was about 15 I saw a beautiful metal coat stand when I was walking home from a friends house. I somehow managed to carry it all the way home, but my parents were not well pleased with me bringing "garbage" home... I still have it and love it though! Curbside finds are the best. I also sometimes comb the free section on Craigslist as I have been wanting to assemble a 50s pink bathroom so far I a toilet and sink but that tub still eludes me. I love finding fabulous Sperrmüll! I can't believe people throw away perfectly wonderful things. Our neighbors down the street put out a green and gold floral couch and I was going to go get it, and then we had this huge thunderstorm and it got rained on. I couldn't believe they'd just leave a couch out to get ruined when there was absolutely nothing wrong with it! I don't like to be self-righteous, but I think that's sinful! I'm glad you got some lovely (dry) pieces. Love your blog!!! so pretty!! love vintage as well.....but I had to leave most of my collection in canada when I moved to Germany last year:((( But collecting small things in Europe while I travel here as well...xo love your vintage dress collections!! A debt of gratitude is in order for a great offer. Your article has demonstrated your diligent work and encounter you have in this field. Splendid. Showbox APK 2018. I adore it perusing.